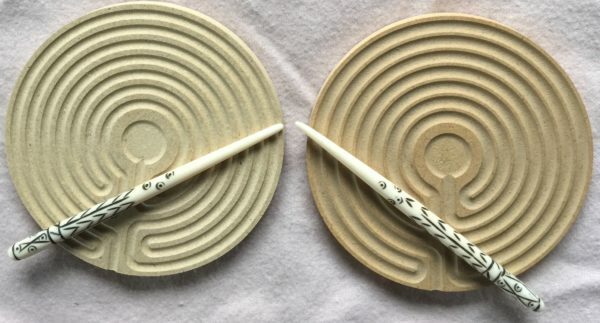 This set of two Cretan miniPaths, inlaid into cutting board plastic, are miniature replicas of our 12″ Cretan finger labyrinth design. A miniPath® functions in much the same way as a finger labyrinth, (to further relaxation, meditation & prayer) except you use a stylus rather than a finger to move through the design (the paths are too narrow for a finger to use). They are designed to fit in a pocket, purse, briefcase or sit on a desktop. Whether at home, work, school, in a car, train or airplane, these two Cretan miniPaths are ready to use anytime for greater relaxation, personal focus and guidance. Included with each miniPath® is a stylus, velour carrying pouch (which doubles as a non-sliding surface on which to rest the miniPath®) and information pamphlet about the design and directions for use. This 4000 year old design is the oldest and most widely used pattern in the world. It’s name was derived from an early representation on the Isle of Crete. It is also referred to as the Classical 7-Circuit design and can be used as a template for the seven major energy centers of the physical body known as Chakras. Understanding the quality of each of these energy centers as it relates to a specific path or circuit on the design, assists you to consciously gain insight into and ferret out answers to the complexities of life. The Cretan looks like the cross section of a human brain and has therefore been used effectively to assist those with Dyslexia, ADHD, neurological disorders etc.